It was late in December 2002. The University of Southern California football team was on the field prepping to play in the Orange Bowl. But as coaches screamed out orders and players sprinted through drills on a sun-splashed South Florida afternoon, their attention was suddenly and completely drawn away from practice. USC football great O.J. Simpson was on the sidelines. Once Simpson was simply the Trojans’ most celebrated player, a common and welcome sight at USC games and practices. That changed in 1994 when Simpson was charged with the murder of his ex-wife, Nicole Brown, and Ronald Goldman. Though he was acquitted, USC and the NFL struggle to avoid any association with the former American icon many believe got away with murder. But on that sunny day in 2002, O.J. was once again a USC Heisman Trophy winner, NFL Hall of Famer and one of the greatest running backs in gridiron history. He pumped hands, signed autographs and posed for pictures for hours. The backlash didn’t take nearly that long. Back in Los Angeles, Simpson’s “homecoming” ignited pure outrage. On radio call-in shows, USC officials were excoriated for allowing Simpson to attend the practice, let alone permitting him to interact with players. 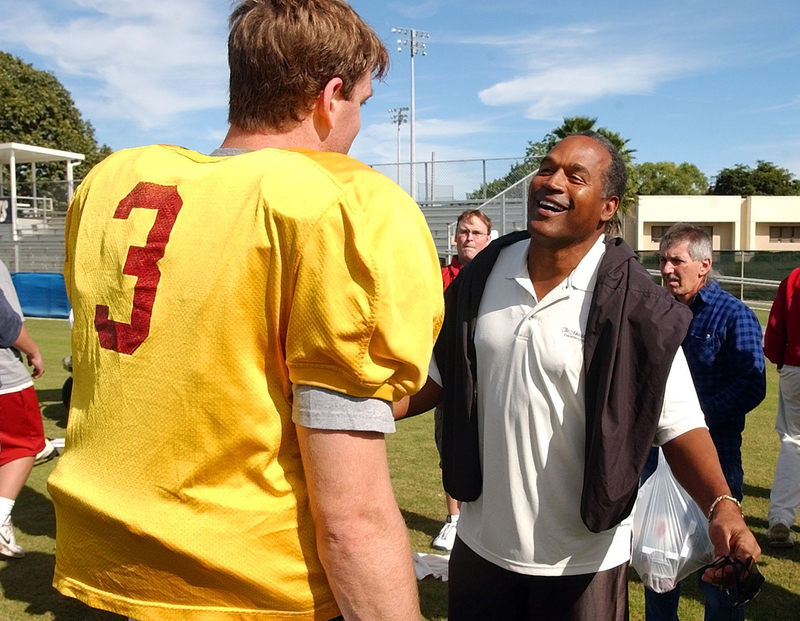 University of Southern California quarterback Carson Palmer talks to former football great O.J. Simpson after practice for the Orange Bowl game on Dec. 28, 2002, in Davie, Florida. The two are winners of the Heisman Trophy. And as was the case with Simpson’s trial and acquittal, the opinions of his impromptu visit (Simpson lived in Miami and the Trojans practiced in nearby Fort Lauderdale) broke down along racial lines. Many African-Americans took Simpson’s USC visit for what it was: a grown man free to go back to his glory days. Many white people still refused to abide by a verdict they believed to be illegitimate — to see him not only freely interacting in society, but being celebrated, made the injustice that much harder to swallow. Simpson was acquitted by a jury in a lawful trial. That’s the only position USC law professor Jody David Armour will take. Armour, who studies the intersection of race and legal decision-making, sees a double standard in the erasure of Simpson football career. “Whenever there’s an officer-involved shooting and the officer is acquitted, white people are always telling us, ‘The justice system has run its course, let’s all abide by its decision.’ And you’re irrational and unreasonable for responding in any other way,” said Armour, author of Negrophobia and Reasonable Racism: The Hidden Costs of Being Black in America. And part of the ghosting of O.J. means never, ever acknowledging his greatness on the football field. Think about it: When was the last time you heard an analyst, anybody, compare and contrast a thrilling young running back to Simpson? Emmitt Smith, Barry Sanders, Tony Dorsett and others are legends cited constantly to praise top backs. During the countless hours of football coverage on television all year-round, it’s not uncommon for former players to revel in sharing anecdotes about Jim Brown’s power, Walter Payton’s determination or Gayle Sayers’ elusiveness. It’s as if no one ever saw Simpson run. I’m not old enough to remember having seen Simpson play, but there’s enough footage of him out there to prove he was as good as it gets. Just go to the internet sometime, if you dare, and watch Simpson glide in and out of his cuts, make would-be tacklers miss and outrun defensive backs who appear to have the angle on him. He wasn’t one of those sprinters who always tried to get to the edge. Simpson ran between tackles and did it well. A silhouette of Reggie Bush, No. 5 of the USC Trojans, is seen in front of the retired No. 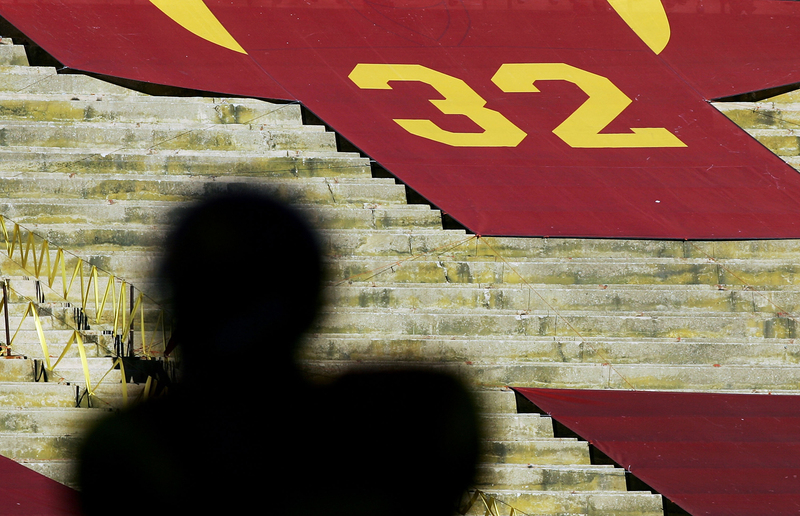 32 jersey of USC alumnus O.J. Simpson against the UCLA Bruins Dec. 3, 2005, at the Los Angeles Memorial Coliseum in Los Angeles. There are plays on which Minnesota Vikings running back Adrian Peterson accelerates through holes as fast as Simpson did. When Buffalo Bills running back LeSean McCoy plants his right foot, cuts and weaves through each level of the defense, he’s running just like Simpson did. The comparisons are out there. It’s just that the media chooses not to make them on air. Most knowledgeable football folk know that Simpson, based purely on ability and production, should be on the Mount Rushmore of running backs along with Brown (there’s endless debate about who else might go up there). NFL old-timers will tell you that no one ran quite like “The Juice,” who was the league’s first player to rush for at least 2,000 yards and the only one to accomplish the feat in 14 games. 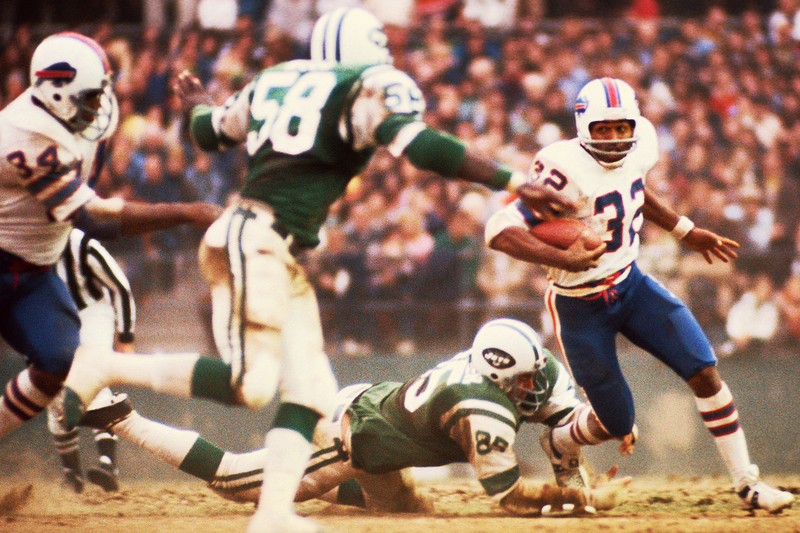 For five consecutive years beginning in 1972, he was selected first-team All-Pro. In 1973, Simpson was the league’s MVP. He would finish his career with 11,236 yards rushing and 61 touchdowns — a legendary career by any reckoning. The problem is, football simply can’t bring itself to say his name. Privately, when some retired head coaches lament the fact that the running game isn’t as important as it once was, they’ll say that it could make a comeback if there were more backs who ran the way Simpson did. They’ll only say it, though, off the record and to people they trust. It’s not worth risking the public’s contempt by being quoted saying something favorable about Simpson. 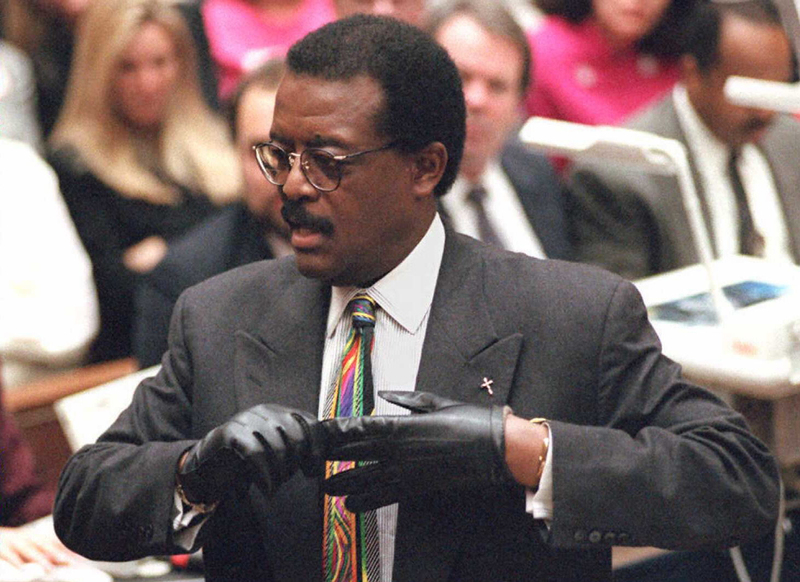 Defense lawyer Johnnie Cochran Jr. puts on a gloves Sept. 27, 1995, while he addresses the jury during closing arguments during the O.J. Simpson double murder trial. Cochran cited the “defining moment in the trial” as the day prosecutor Christopher Darden asked Simpson to try on the bloody evidence gloves and the defendant told jurors they were too small for his large hands. Nowhere is the struggle over Simpson’s legacy greater than at USC. But don’t bother trying to get anyone inside USC’s athletic department to talk about Simpson and how he led the Trojans to a national championship and won the Heisman, one of the university’s six prominently displayed on campus. Still, after all these years, no one wants to talk about him. In Buffalo, New York, they can relate. Southern California and western New York have little in common other than Simpson. The No. 1 overall pick in the 1969 NFL/AFL draft, Simpson spent nine of his 11 NFL seasons with the Buffalo Bills. In 2009, when the franchise announced its 50th anniversary team as chosen by the fans, there was a glaring omission: Simpson. Thurman Thomas was the running back chosen. Yes, Thomas finished his career with more yards than Simpson. Yes, Thomas is also a Hall of Famer. But Simpson, the first occupant on the Bills’ Wall of Fame, wasn’t missing because of second thoughts about his on-field productivity. Excluding Simpson from anything chronicling the first 50 years of the Bills is akin to discussing the Chicago Bulls without mentioning Michael Jordan. Buffalo Bills running back O.J. Simpson (No. 32) carries the ball against New York Jets defenders Ed Galigher (No. 85) and Bill Ferguson (No. 58) at Shea Stadium. During this game Simpson broke the single season NFL rushing record with 2,003 yards. Local collector Greg Tranter supplied Bills memorabilia for the anniversary exhibit. For him, including Simpson was an easy call. Armour of USC definitely agrees. At the very least, he conceded, Simpson physically abused and emotionally terrorized his ex-wife, which is despicable. His achievements earlier in life, though, should not be viewed through that lens, she said. Undeniably, it would so much easier to simply remove Simpson from football history and forget he ever existed. But no matter the unyielding resentment toward Simpson, his body of work still stands. That’s a fact, beyond reasonable doubt.